George Berkeley (1685-1753) also known as Bishop of Cloyne, was one of the great philosophers of the early modern period.His main philosophical achievement was the theory of empirical idealism or immaterialism. As an Anglo-Irish philosopher, Berkeley was born on March 12, 1685,as the eldest son to William Berkeley, an officer of customs, near Kilkenny in Ireland. 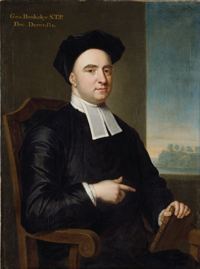 Although Berkeley's father was English, George Berkeley always considered himself Irish. Brought up at Dysert Castle, Berkeley entered Kilkenny College in 1696 and Trinity College, Dublin, in 1700, from where he graduated with a bachelor's degree in 1704.He later completed his master'sdegree in 1707 and became a Senior Fellow in 1717. Berkeley was ordained as an Anglican priest in 1710, which was common at the time for British academics. He remained at his alma mater until 1724 as a tutor and a Greek lecturer. While at Trinity College, where the curriculum was notably modern, Berkeley encountered the new science and philosophy of the late seventeenth century—characterized by hostility toward Aristotelianism. Meanwhile, he also spent time in London where he associated with important intellectuals, such as the Irish poet and satirist Jonathan Swift (1667-1745), the English essayist and poet Joseph Addison (1672-1719), the Irish essayist and playwright Sir Richard Steele (1709-1729), and the English poet Alexander Pope (1688-1744). 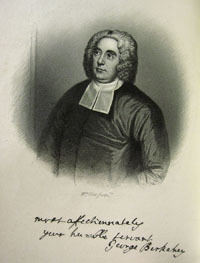 Berkeley also extensively visited Europe as he accompanied both Lord Peterborough (1713-1714) and cleric St. George Ashe (1658-1718), son of the Provost of Trinity College on their continental tours. Berkeley wrote his most well-known works while at Trinity College. He began philosophical notebooks, traditionally referred to as Philosophical Commentaries. They were written in a fairly personal way,as they were never intended for publication.These notebooks provide rich a documentation of Berkeley's early philosophical evolution - enabling the reader to track the emergence of his immaterialist philosophy from a critical response to Descartes, Locke, Malebranche, Newton, Hobbes, and the others. Berkeley made great contributions in the fields of philosophy, mathematics, and economics. Along with John Locke (1632-1704) and David Hume (1711-1776), Berkeley is considered one of the most famous Empiricists. Indeed, Berkeley advanced the theory of "immaterialism" and is widely considered one of the greatest philosophers of the early modern era.His earliest publication was on mathematics, but the first that brought him notice was his "Essay Towards a New Theory of Vision", first published in 1709. The essay was an influential contribution to the psychology of vision.He also developed doctrines relevant to his idealist project. He discussed the limitations of human vision and advanced the theory that proper objects of sight are not material objects, but light and color. My design is to show the manner wherein we perceive by sight the distance, magnitude, and situation of objects. Also, to consider the difference there is betwixt the ideas of sight and touch, and whether there be any idea common to both senses --Berkeley, George. An Essay Towards a New Theory of Vision (1709). The next publication to appear was the "Treatise Concerning the Principles of Human Knowledge" in 1710, which had great success and gave him a lasting reputation, though few accepted his theory that nothing exists outside the mind. This was followed in 1713 by "Three Dialogues between Hylas and Philonous", in which he propounded his system of philosophy, the leading principle of which is that the world -- as represented by our senses -- depends (for its existence) on being perceived.Together, these three books contain the essential elements of Berkeley's immaterialism, a view that he was to hold without major modification until the end of his life. During 1714–1720, he interspersed his academic endeavors with periods of extensive travel in Europe, including one of the most extensive Grand Tours of the length and breadth of Italy ever undertaken. In politics, Berkeley was a Hanoverian Tory—a Tory supporter of the British royal house of Hanover, which originated in Germany. He defended the ethics of his position in three sermons, which were published as "Passive Obedience" (1712). Thus, with four major books in five years, the foundations of his fame were laid. When he first left Ireland in 1713 on leave of absence, he was already a man of mark in the learned world. 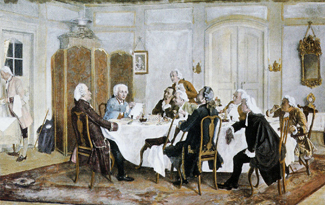 His books were reviewed in the Continent while Gottfried Wilhelm Leibniz, the wide-ranging author of the Monadology, knew of his immaterialism and commented upon it. In 1721, Berkeley took Holy Orders in the Church of Ireland, earning his doctorate in divinity, and once again choosing to remain at Trinity College Dublin, lecturing in Divinity and Hebrew. During 1721-1722, he was made Dean of Dromore, and in 1724, Dean of Derry.In 1725, he began the project of founding a college in Bermuda to train ministers and missionaries in the colony, in pursuit of which, he gave up his deanery with its income of £1100. In 1728, he married Anne Forster, daughter of John Forster, Chief Justice of the Irish Common Pleas. He then went to America on a salary of £100 per annum. He landed near Newport, Rhode Island, where he bought a plantation in Middletown, Rhode Island—the famous "Whitehall". It has been claimed that he introduced Palladianism in America by borrowing a design from Kent's Designs of Inigo Jones for the door-case of his house in Rhode Island. He also brought to New England John Smibert, the British artist he "discovered" in Italy, who is generally regarded as the founding father of American portrait painting. Meanwhile, he drew up plans for the ideal city he planned to build in Bermuda. He lived at the plantation while he waited for funds for his college to arrive. Eventually, word came that the grant would not be paid, after which, Berkeley returned to London in October 1731. Several American universities, Yale in particular, benefited from Berkeley's visit; and his correspondence with Samuel Johnson, later President of King's College (Columbia University), is of philosophical importance. Upon his return to London, Berkeleybecame very busy with his writings. He focused on writing a defense of his earlier work on his vision entitled "TheTheory of Vision, Vindicated and Explained" (1733). Berkeley then wrote "TheAnalyst: a Discourse Addressed to an Infidel Mathematician" (1734), a cutting critique of the foundations of Newton's calculus. Besides, he also continued his humanitarian work and took part in efforts to create a home for the city's abandoned children. The Foundling Hospital was founded by a Royal Charter in 1739, and Berkeley is listed as one of its original governors. In 1734, he was appointed Bishop of Cloyne in Ireland, a position he was to hold until his death. Soon afterwards, he published "Alciphron, or The Minute Philosopher". As a devoted believer of God, Berkeley felt that materialism was dangerous because it promoted skepticism by questioning the validity of our senses. Berkeley thought that materialism also promoted atheism, as it discounted the importance of God, trying to show that the world could run without his assistance. Berkeley has also published other prodigious works, such as Sermon preached before the incorporated Society for the Propagation of the Gospel in Foreign Parts(1732), A Defence of Free-thinking in Mathematics, with Appendix concerning Mr. Walton's vindication of Sir Isaac Newton's Principle of Fluxions(1735), Reasons for not Replying to Mr. Walton's Full Answer (1735), and revised editions of the Principles and the Dialogues in 1734. Berkeley was widely considered a good bishop concerned with both Protestants and Catholics. He had been made Bishop of Cloyne, Ireland, in 1734,where he mostly remained until his retirement in 1752. The year he became bishop, he published "Analyst" (1734), in which, he criticized Newtonian mathematics and suggested certain corrections. Between 1735 and 1737, he published a series of papers entitled "The Querist", which dealt with the welfare of Ireland. The plague years of 1740 and 1741 led him to publish his "Siris, or a Chain of Philosophical Reflexions and Enquiries concerning the Virtues of Tar-Water" (1744). He had encountered the medicinal use of tar-water while in America, and, in this work, he endeavored to account for its allegedly universal curative powers by means of certain neo-Platonic doctrines, which he had studied during his stay onRhode Island. Berkeley's health, which had begun to fail, was seriously affected by the death of his eldest son in 1750. He had long wanted to retire to Oxford to be with his younger son, who was studying there;hence, he took the extraordinary step of resigning his bishopric. However, the King refused to accept his resignation and declared that he might live where he chose, but he must die a bishop. Berkeley moved to Oxford in 1752. He died there the following year on January 14 and was buried in Christ Church. An Essay towards a New Theory of Vision: This was one of the most successful of Berkeley's early worksand is regarded as an important contribution to the study of vision. This contains Berkeley's attempt to provide a theory of the visual perception of depth. Berkeley argues that distance is not immediately perceived via sight, though it is immediately perceived using touch. All we can immediately perceive visually is the two-dimensional arrangement of objects, and not their distance from us. This far, Berkeley agreed with many of his contemporaries. Berkeley goes further, arguing that the spatial properties perceived by sight are not even the same properties as those gained from touch. In an important metaphor, Berkeley compares visual ideas to language; they serve as the signs of the spatial ideas correlated with them. Berkeley's theory of vision is, in several important respects, a special case of his general phenomenalism restricted to the analysis of visual perception of space. A Treatise concerning the Principles of Human Knowledge: In his Introduction to the Principles of Human Knowledge he argued that, as Locke described abstract ideas (Berkeley considered Locke's the best account of abstraction), (1) they cannot, in fact, be formed, (2) they are not needed for communication or knowledge, and (3) they are inconsistent, and, therefore, inconceivable. Three Dialogues between Hylas and Philonous: In this, Berkeley defends two metaphysical theses: idealism (the claim that everything that exists either is mind or depends on mind for its existence) and immaterialism (the claim that matter does not exist). De Motu: Berkeley's De Motuinvolvesan application of his immaterialist principles to problems of motion in 1721. Alciphron or the Minute Philosopher: Berkeley wrote this book while he was in Newport. In it, Berkeley attempted to refute what he saw as the irreligious views popular among literary figures of his time. Alciphron touched on some of the same issues as Berkeley's earlier metaphysical books, but was primarily concerned with defending Christian doctrine. The setting for Alciphron is recognizably Newport and the book's impact was greater in the New World than it was in the Old. The Analyst: With this, Berkeleypublished an attack on the coherence of Newton's version of the calculus, The Analyst or a discourse addressed to an infidelmathematician (1734). This tract aroused a great deal of discussion and was the occasion of several polemics on both sides. A Defense of Free-thinking in Mathematics: This was aimed at showing that mathematicians so admired by freethinkers worked with concepts that could not withstand close scrutiny, so that the confidence given to them by "the philomathematical infidels of these times" was unjustified. The Querist: Thispresents arguments for the reform of the Irish economy. This was his contribution to the attempt to persuade the English to change their policy toward Ireland. The Querist is rather peculiar in form, consisting entirely of questions. Siris: a chain of Philosophical Reflections and Enquiries concerning the Virtues of Tar-water: This is Berkeley's last philosophical work, and includes a discussion of the medicinal virtues of tar water, followed by proper philosophical discussions that many scholars see as a departure from his earlier idealism. Berkeley's affectionate disposition and genial manners made him highly admired and loved.As a result of which, he was also held in warm regard by many of his contemporaries. The city of Berkeley in California, was named in George Berkeley's honor, but the pronunciation of the name evolved to suit American English.